A smart carry case with four fun, wipe-clean books and a special pen to help children learn the skills they will need for school. The activities help children learn vital skills such as pen control and drawing letters and numbers, and with the special pen, they can practise again and again. 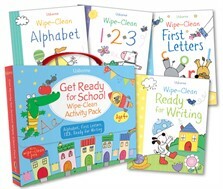 Includes reduced-size versions of Wipe-Clean Alphabet, Wipe-Clean 123, Wipe-Clean First Letters, Wipe-Clean Ready for Writing.